The Insider Monkey team has completed processing the quarterly 13F filings for the December quarter submitted by the hedge funds and other money managers included in our extensive database. Most hedge fund investors endured a torrid quarter, which certainly propelled them to adjust their equity holdings so as to maintain the desired risk profile. As a result, the relevancy of these public filings and their content is indisputable, as they may reveal numerous high-potential stocks. The following article will discuss the smart money sentiment towards Enbridge Inc (NYSE:ENB). Is Enbridge Inc (NYSE:ENB) a buy right now? The smart money is taking a pessimistic view. The number of long hedge fund positions fell by 3 recently. Our calculations also showed that ENB isn’t among the 30 most popular stocks among hedge funds. We’re going to analyze the recent hedge fund action encompassing Enbridge Inc (NYSE:ENB). What does the smart money think about Enbridge Inc (NYSE:ENB)? At Q4’s end, a total of 18 of the hedge funds tracked by Insider Monkey held long positions in this stock, a change of -14% from one quarter earlier. 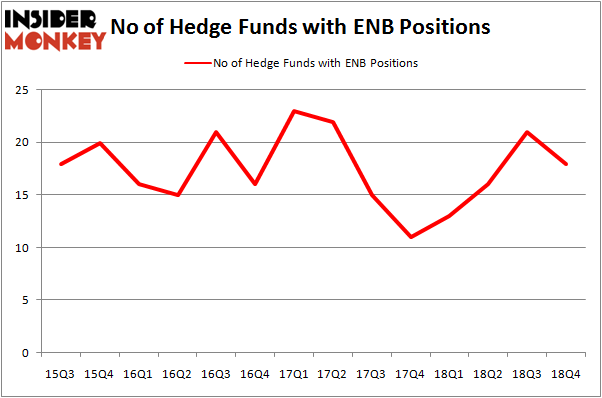 The graph below displays the number of hedge funds with bullish position in ENB over the last 14 quarters. With hedgies’ positions undergoing their usual ebb and flow, there exists a select group of key hedge fund managers who were upping their stakes meaningfully (or already accumulated large positions). The largest stake in Enbridge Inc (NYSE:ENB) was held by D E Shaw, which reported holding $72.9 million worth of stock at the end of September. It was followed by Renaissance Technologies with a $29.2 million position. Other investors bullish on the company included Point72 Asset Management, Magnetar Capital, and Citadel Investment Group. Because Enbridge Inc (NYSE:ENB) has witnessed falling interest from the entirety of the hedge funds we track, it’s safe to say that there were a few fund managers who were dropping their positions entirely last quarter. At the top of the heap, Vince Maddi and Shawn Brennan’s SIR Capital Management dumped the biggest stake of the “upper crust” of funds watched by Insider Monkey, totaling close to $4.1 million in stock. Paul Marshall and Ian Wace’s fund, Marshall Wace LLP, also cut its stock, about $0.9 million worth. These bearish behaviors are interesting, as total hedge fund interest dropped by 3 funds last quarter. Let’s now review hedge fund activity in other stocks – not necessarily in the same industry as Enbridge Inc (NYSE:ENB) but similarly valued. These stocks are BlackRock, Inc. (NYSE:BLK), The Goldman Sachs Group, Inc. (NYSE:GS), Ambev SA (NYSE:ABEV), and Duke Energy Corporation (NYSE:DUK). All of these stocks’ market caps match ENB’s market cap. As you can see these stocks had an average of 34 hedge funds with bullish positions and the average amount invested in these stocks was $2128 million. That figure was $175 million in ENB’s case. The Goldman Sachs Group, Inc. (NYSE:GS) is the most popular stock in this table. On the other hand Ambev SA (NYSE:ABEV) is the least popular one with only 13 bullish hedge fund positions. Enbridge Inc (NYSE:ENB) is not the least popular stock in this group but hedge fund interest is still below average. Our calculations showed that top 15 most popular stocks among hedge funds returned 19.7% through March 15th and outperformed the S&P 500 ETF (SPY) by 6.6 percentage points. Hedge funds were also right about betting on ENB as the stock returned 20.0% and outperformed the market as well. Itau Unibanco Holding SA (ITUB): Are Hedge Funds Right About This Stock? Hedge Funds Have Never Been This Bullish On Thermo Fisher Scientific Inc. (... 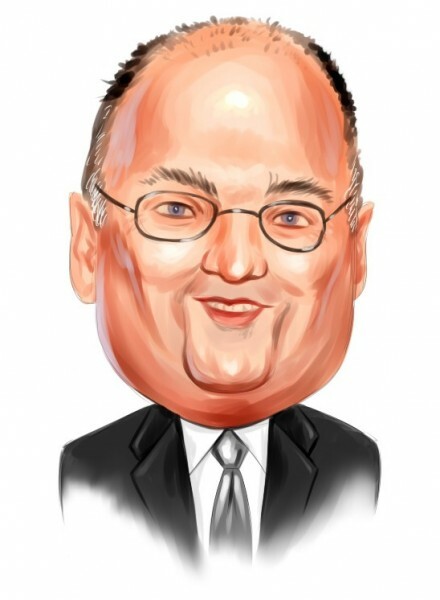 Were Hedge Funds Right About Buying Costco Wholesale Corporation (COST)? Were Hedge Funds Right About Dumping Twenty-First Century Fox Inc (FOX)? Were Hedge Funds Right About Buying United Technologies Corporation (UTX)? Do Hedge Funds Love Diageo plc (DEO)?